Come Women’s day, packaged food brands promote their products using different variants of this message to women - “you deserve it”, “take control of your health”, “put your health first” etc. It is a pity that we (women) need such reminders from these food brands to take care of our health. 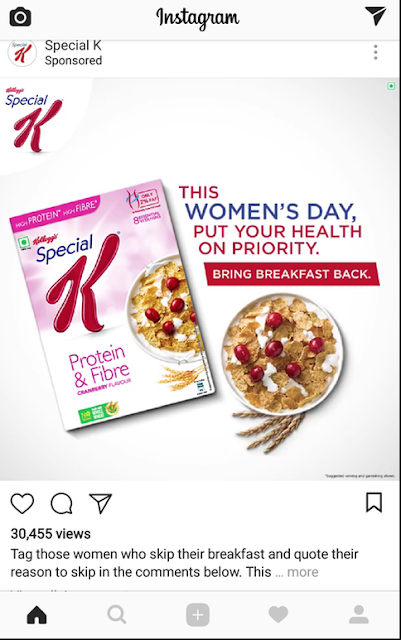 One such brand that caught my attention yesterday was Kelloggs Special K, the breakfast cereal that promises weight loss and a slim waist like that of Deepika Padukone. Is this the breakfast that smart women who work hard and have multiple responsibilities would like to eat? I hope not. I wanted to look at the ingredients of this cereal in detail. Both Amazon and Big Basket don’t list the ingredients. With online grocery shopping on the rise, there is no way consumers can get to see the nutrition profile available in packaging before placing an order. It is high time that regulations are in place and e-commerce players are being asked to display the exact packaging details in the respective product pages. 1) The first thing the weight loss industry tells people is “Avoid rice. Eat only 1 roti”. And what are the first two ingredients in a weight loss focused breakfast cereal? Rice and Wheat, which constitutes 70% of this cereal. Are you surprised? 2) The third ingredient is of course Sugar. There is also “Liquid Glucose”, which is another variant of sugar. 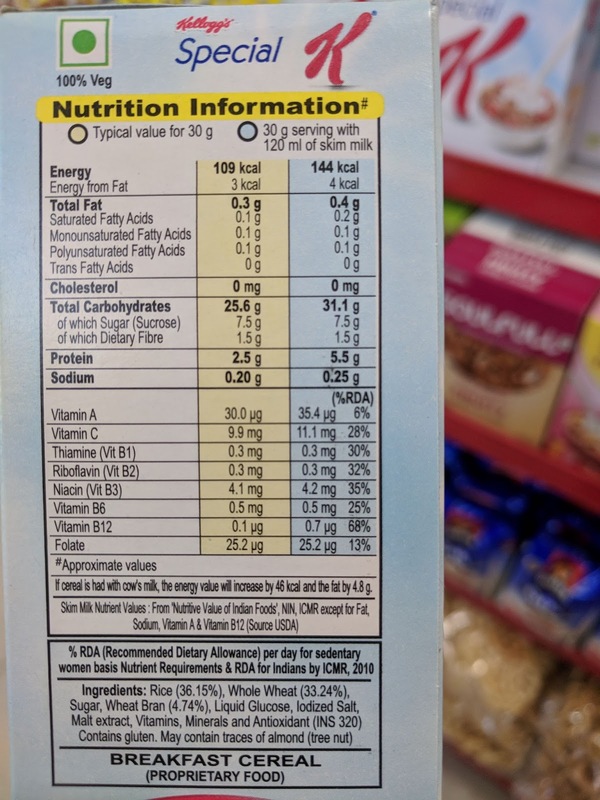 A 30 gm serving of this cereal contains 7.5 gm of sugar (nearly 2 tsp). Kelloggs Chocos, the breakfast cereal for kids contains 10.4 gm of sugar for the same serving size of 30 gm. Not much difference, isn’t it? No, these are not the “good” anti-oxidants found in fruits and vegetables that are good for our body. Rather, these are chemicals that protect a food from deterioration caused by oxidation. INS 320 - Butylated hydroxyanisole (BHA), a petroleum derivative. It is banned in Japan. A 30 gm serving of this cereal contains 2.5 gm of Protein and 1.5 gm of Dietary Fibre. How will this aid in weight loss? Is it through starvation? Does it really have "high protein, high fibre” like the brand claims? A 30 gm serving of this cereal contains 3.3 gm of Protein and 3.0 gm of Dietary Fibre. Slightly better than the Original version but not good enough. Many fruits and vegetables have higher amounts of fibre than this cereal. 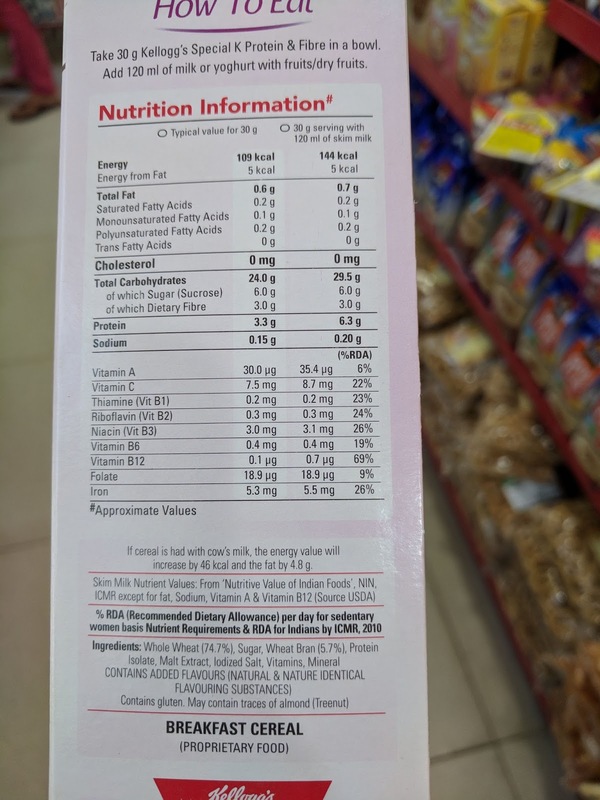 Whole wheat atta in itself contains 3.2 gm of protein per 30 gm. You might as well eat 1 phulka roti to get the same protein. This product is a big sham, with all the right tag-lines to attract health-conscious consumers. We women are better off with proper home-cooked Indian breakfast. We don’t need such packaged cereals to take care of our health. My breakfast today is little millet dosas with dry coconut-garlic podi smeared with gingelly oil. Wholesome, balanced and healthy. And it took me just 10 minutes to make them. Thank you for this article. I buy this cereal atleast once a month. From now on I won't.